Keep your bathroom tidy with the Avenue Greene Lowery Hamper. This Hamper is just the right size to store a considerable amount of clothing, towels or linens that are on their way to the washing machine. 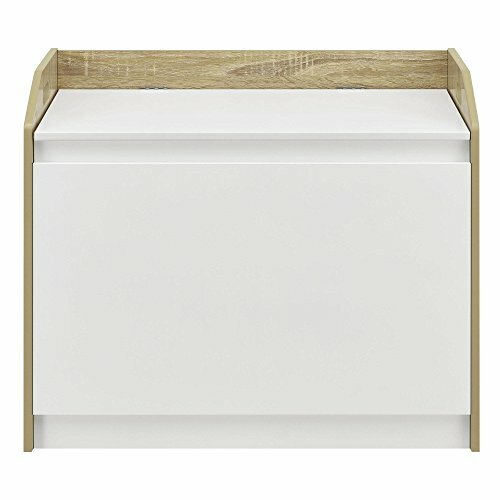 The hamper has a strong hinge to keep the lid open while you are transferring your clothing in or out of the hamper and comes in a two-tone white and light brown finish. The strong MDF and melamine build makes this hamper sturdier than most. The top surface can even double as a seat, supporting up to 30 lbs. This unit requires assembly upon opening by 2 adults. After fully assembled it measures to be 20.3"H x 24.6"W x 15.7"D.
Top surface holds up to 30 lbs. If you have any questions about this product by Avenue Greene, contact us by completing and submitting the form below. If you are looking for a specif part number, please include it with your message.